When businesses prosper, communities & families thrive. Employees are your most valuable asset and your greatest risk. Without a people strategy, your business will not succeed in attracting and retaining the type of talent that will drive your business forward. 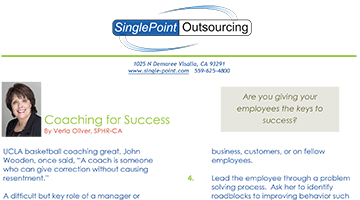 At SinglePoint Outsourcing, we have the human resources expertise to help you reach your full potential. Let us show you the positive difference we can make in your business. Our full-service partner program frees you up to spend time growing your business while we handle human resources administration. This program includes a full suite of employee insurance benefits for you and your employees to choose from, payroll and tax filing services, workers compensation insurance, claims management, compliance management, advisory services, and much more! We will provide dedicated expert human resources support to help relieve the strain on your organization. This program is a comprehensive offering, similar to the Partner Program, but entails the employer keeping their current health insurance benefits and workers compensation insurance in place. 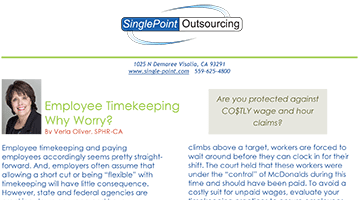 This scalable version of HR outsourcing provides back-office support layered with a set number of HR consulting hours to meet your business and financial needs. Includes payroll and tax filing, compliance management, and administrative relief. Prime candidates are scarce today. Don’t end up with the “leftovers” in the job market. We will partner with you to create an innovative and smart strategy for targeting, attracting and hiring the best talent. Keep your current back-office solution in place while gaining the confidence that comes with accessing a team of experts in a full range of human resources issues. As with the Foundations Program, enjoy the flexibility of deciding how many HR consulting hours you wish to utilize on a monthly basis. We will help you develop effective leaders equipped to tackle today’s most pressing employment challenges. Having the right leaders raises the quality and productivity throughout your entire organization. The statistics are alarming. 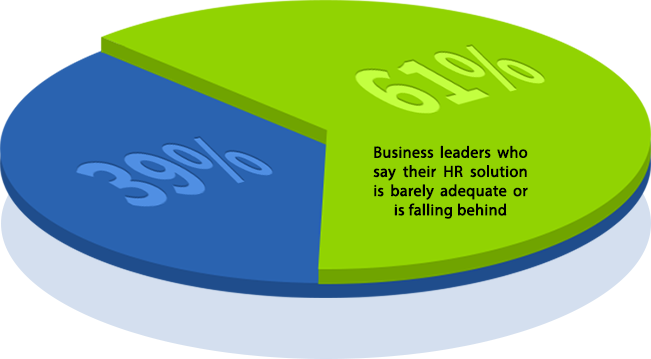 The odds are that your current human resources solution is not adequate for your changing needs. Call us today at (559) 625-4800 to discuss how we can provide support to you and your employees. One of our knowledgable business consultants will meet with you for a complimentary needs consultation. We will conduct a no-cost evaluation and share areas of concern. We will provide you a proposal of our recommendations. Choose the option that is best for your company and fits your budget. We will conduct a fullHR audit to ensure we uncover vulnerabilities. We get right to work on fulfilling your compliance needs and execute identified services. We will create and roll out a customized handbook that has been tailored to your company’s needs. Our team will collect updated documentation from each employee within your company. Your SinglePoint technology portal will be created for use by you and your employees. We are a locally owned and managed business that understands small business and the uniqueness of the Central Valley business climate. In business since 1998, we have successfully weathered the same storms our clients have. We have learned what it takes to thrive, and we enjoy sharing our experience with our clients. We have a passion for the communities in which we operate and the families that call them home. We know that successful businesses mean jobs, food on the table, and educational opportunities for children. For us, helping businesses is much more than a profit and loss analysis, it’s about building a future.